*an online screener of this film was provided by The Asylum. Writers: Richard Schenkman, Keith Allan and Delondra Williams. Cast: Anthony Michael Hall, Daryl Hannah, Alan Ruck, Rachel G. Fox, Shirley Jones and Jennifer Taylor. 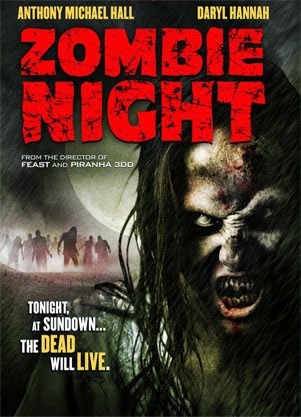 Zombie Night is a made for television film, which was produced by The Asylum. This reviewer is very familiar with The Asylum's work in low budget filmmaking, so one goes into one of their movies with reasonable expectations. And, Zombie Night certainly did not exceed any hopes. This title, while well shot, is developed from a fairly weak screenplay, which is almost plotless. The focus on minor characters does not really help the viewer immerse into the experience, as well. Overall, Zombie Night is a fairly ho hum affair and in a saturated zombie film market, it will soon be reburied. The story for the film can be discussed in just a few lines. A 24 hour zombie outbreak tests two groups of neighbours, for control of a little concrete safe house - the end. One could also add in a few subplots, involving: a stalkerish former student and police officer, a love story between two teens and that is about it. The film has very little to offer in the story department. Even the zombies need more spring in their step. As stated, the screenplay for the film is very bare bones. A screenplay is the foundation from which the film is developed. The one developed here seemed rushed, or put together without much thought. 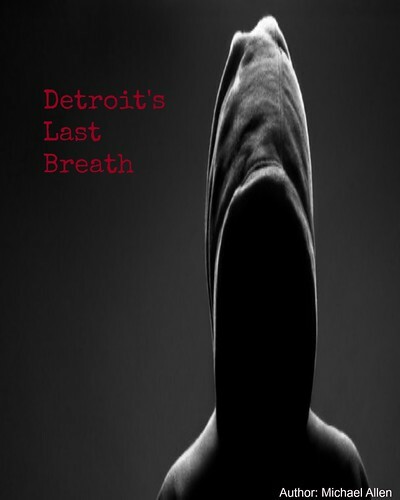 This seems strange since the story was developed from a trio of writers: Richard Schenkman (Mischief Night), Keith Allan (Rise of the Zombies) and Delondra Williams. However, The Asylum is known to rush projects from start to finish in under 30 days or less. How much time was alloted for screenwriting? Very little attention was given to this film's core themes. The characters in this film are underdeveloped. The story does not offer much in the way of plot, so there is, unsurprisingly, very little time spent on characters. They all seem interchangeable and forgettable. Characters are not given any backstory, nor complexity. They all seem to just occupy space and scream at the correct moments. Of course, there are the usual cliches here, including: the protective father, the terrified mother and the romantic teenager. But, these are all flat characters. They are not worth watching and there are few opportunities to empathize with any of them. Zombie Night is a very average undead feature. Although, director John Gulager (Feast) does show a sense for atmosphere and makeup effects. This watcher laughed during a few moments in which zombie sauce flew about and onto many of the actors. Also, there is fog and eerie green lighting in a few scenes, which creates a suitable horror atmosphere. As well, the picture is often moving ahead and rarely static. Yet, the lack of characterizations and redundancy of the material offer very few surprises. As well, there are few truly horrifying moments in the film and some viewers might find the material mundane and boring. At the end of the day, this film does not stand out in many ways in the recent avalanche of zombie films. This feature has already debuted on television and a home entertainment release is looming; this critic would recommend that you seek out other and better films in the genre. 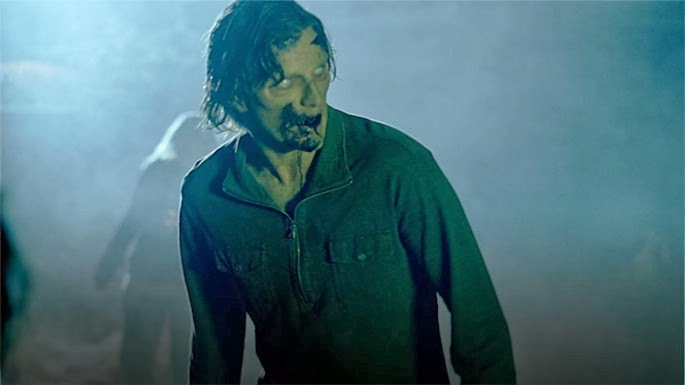 Zombie Night almost seems like a family friendly undead film and that is not what a zombie film should be. This title needed more scares, novelty and surprises. What it does deliver is a lackluster viewing experience. Overall: 5.5 out of 10 (mostly good acting, some decent night shooting, more tension and conflict required).